4 Bedroom Detached House For Sale in Stoke-on-Trent for Offers Over £270,000. 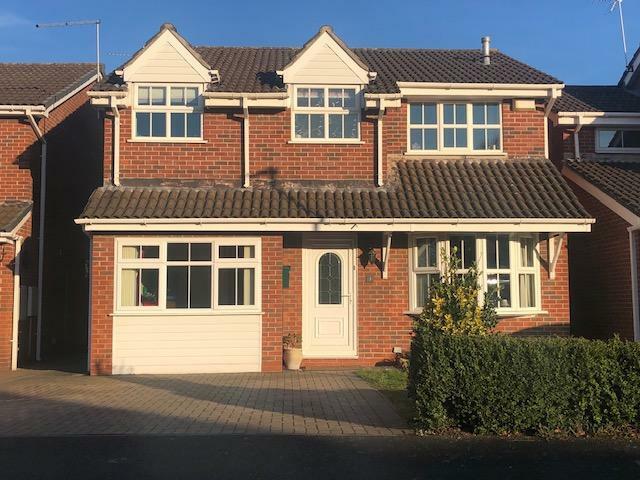 This spacious family home is situated in a popular residential area of Alsager and within walking distance of the High School, several local primary schools and the village centre. This four bedroom detached modern property boasts a light lounge through dining room, contemporary fitted cream kitchen, utility rom, family room, conservatory and downstairs WC. To the first floor there are four bedrooms, a lovely family bathroom and an en-suite to the master bedroom. A block paved driveway offers parking and gardens to the front and rear. A great versatile family home. another useful reception room having double glazing throughout and twin opening doors leading to the rear garden. single pan radiator and TV aerial point. Space and plumbing for washing machine and Tumble dryer, wall mounted gas central heating boiler. Double glazed frosted window to the side and radiator. Two piece suite, comprising WC and wash hand basin. Laminate flooring. Brilliant second reception room, with double glazed window to the front elevation and a single panel radiator. TV aerial point. Built in airing cupboard and doors leading off. Double glazed window to front elevation, single panel radiator range of built in wardrobes with sliding doors, over bed storage with matching bedside cabinets and chest of drawers. Door to the ensuite. White three piece suite, comprising vanity unit with wash hand basin with concealed cistern and WC, fully tiled shower cubicle with multi jet power shower over, Inset ceiling spot lighting, extractor fan and laminate flooring, Upvc double glazed window to front elevation. Double size room with double glazed window to the front elevation and single panel radiator. Built in wardrobes, TV point and useful storage cupboard. Double size room with double glazed window to the rear and radiator. Built in wardrobes. double size room with double glazed window to the rear elevation and single panel radiator. Built in wardrobes. Double glazed obscure window to rear elevation and feature chrome radiator, twin ended bath with chrome effect electric shower over, wash hand basin with water fall tap and WC. Oak flooring, pvc bathroom wall cladding, inset spot lighting with coloured led lights and panel having multi changing coloured led lighting. To the front of the property there is a blocked paved driveway leading to parking, lawned area and flower border. Indian slate paved path at the side leads to the rear garden. The rear garden is enclosed having lawned area, flower borders, useful tool store and Indian slate paved patio.